Many experts believe Ted Bundy's killing spree spanned decades. During his reign of terror, Bundy was able to elude police for years, escape prison twice and even earn special celebrity-like treatment while awaiting trial. 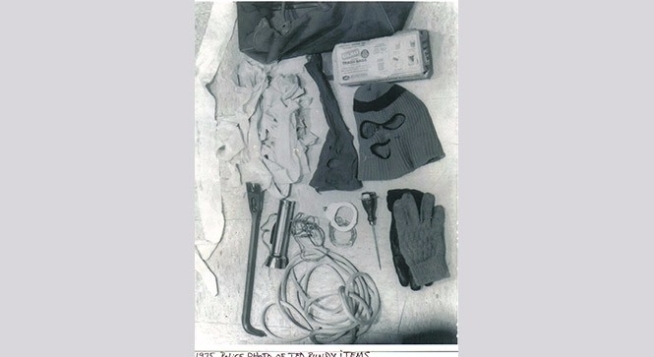 Look at the photos to examine key pieces of evidence Bundy's FBI file. Ted Bundy was arrested in 1975 in Utah after he failed to pull over during a routine traffic stop. His now iconic VW Beetle contained a disturbing array of items seen in the photo above. Police were forced to let Bundy go due to a lack of sufficient evidence. Sadly police did not find the Polaroids of dead victim that Bundy had hidden in his glove compartment. Bundy in police custody again in October of 1975. 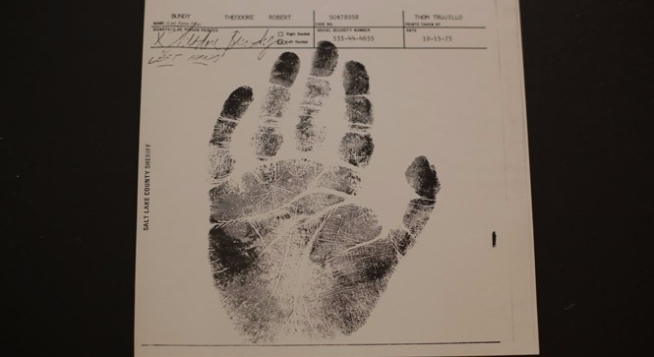 You can see the serial killer's handprint in the photo. Police put him in a lineup before Carol DaRonch, the woman he tried to convince that he was a police officer. She correctly identified Bundy, who was charged with kidnapping and attempted criminal assault. Bundy was allowed to leave police custody after his parents paid the $15,000 bail, but the FBI closely tracked his movements while waiting for the trial. The day after he was transported to Pitkin County Courthouse in Aspen, Bundy leaped from the courthouse library window. He intended to serve as his own lawyer in the trial for the murder of Caryn Eileen Campbell. Despite being a convicted criminal and awaiting trial for murder, Bundy received special treatment, allowing him to be unguarded and directly contributing to his escape. This is the FBI's official report of the incident. Three days after his escape from custody, Salt Lake City authorities issued a $100,000 bond. Bundy was supposed to be serving 15 years for kidnapping and was about to begin his first murder trial, instead he was on the run. 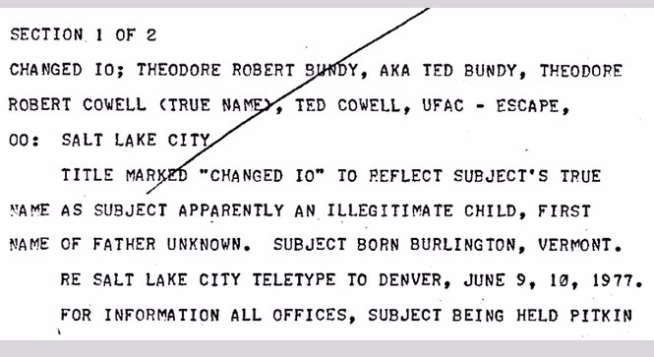 In FBI's official documents, authorities made note that Bundy had changed his name from the given Cowell. 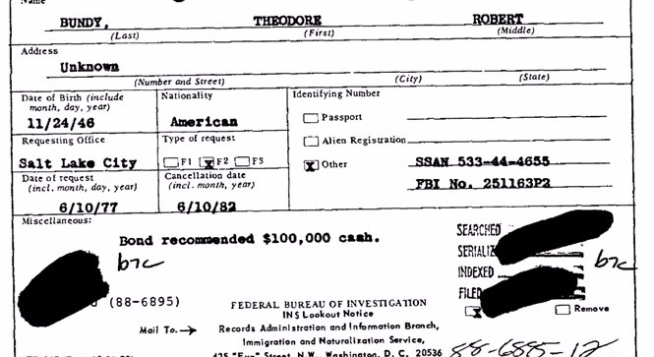 They also noted that the wanted man was born to a single mother and that his father has never been identified, although there is a disturbing rumor that his grandfather was his biological father. 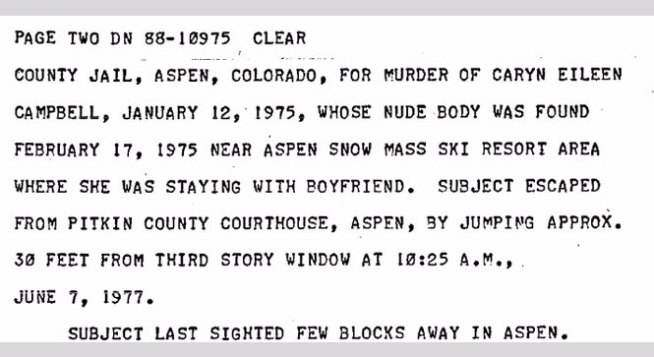 The manhunt for Bundy continued after his Aspen escape. 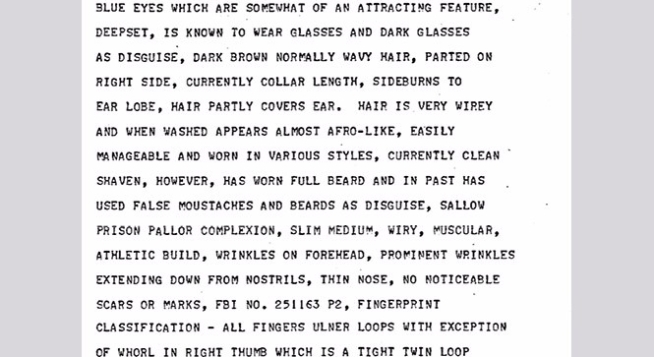 FBI compiled an comprehensive description of the killer, noting his "attractive" blue eyes, known disguises and new prison pallor. Bundy's appearance would be a topic of media frenzy once his notoriety reached national attention. 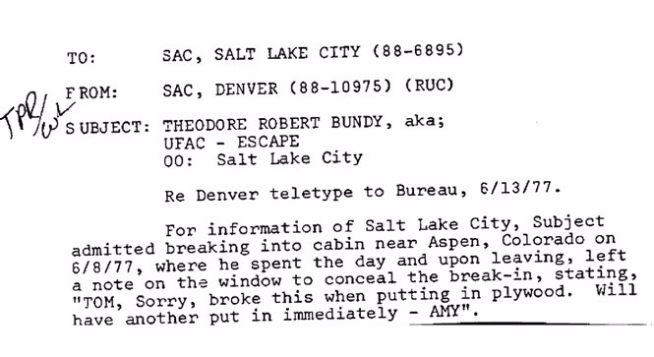 Bundy's 6-day escape from the Aspen prison rightfully terrified the police and the public. 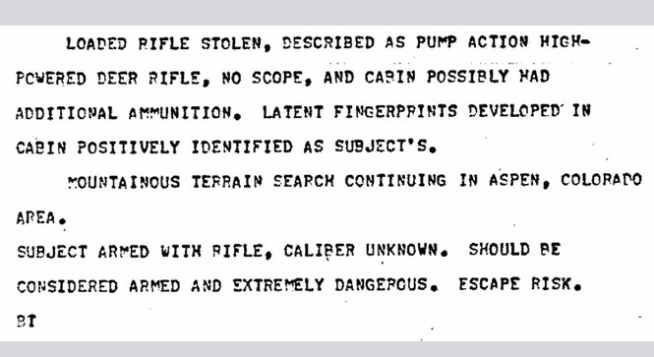 While running from the courthouse, Bundy broke into a nearby cabin, stealing a riffle and possible ammunition. Authorities tirelessly searched the mountainous terrain, hunting for the extremely dangerous killer. By June 13, 1977, Bundy was back in police custody. With little food or rest, and after spraining his ankle while fleeing, Bundy was pulled over for driving erratically. Once back behind bars, police interrogated Bundy about his whereabouts during his escape. The killer admitted to breaking into a cabin and leaving the bizarre note above in an attempt to cover his tracks. Many close to Bundy encouraged him to sit tight, noting that his escape only weakened his case. But Bundy was not willing to idle behind bars. After plotting for months, Bundy snuck out of prison on December 30, 1977. Given the skeleton holiday staff, no one noticed he was gone until the following day. This time Bundy was able to roam free for weeks. 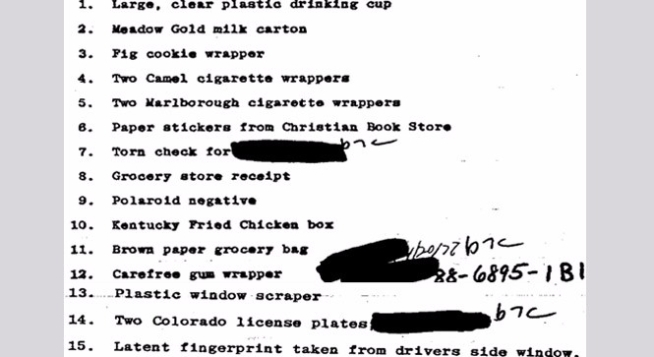 Police eventually found a stolen car that he had been driving and took inventory of the bizarre assortment of items listed above. Experts note that Bundy wanted to turn his life around and maintain a low profile after his second escape from prison. But the cold-blooded killer couldn't seem to control himself. 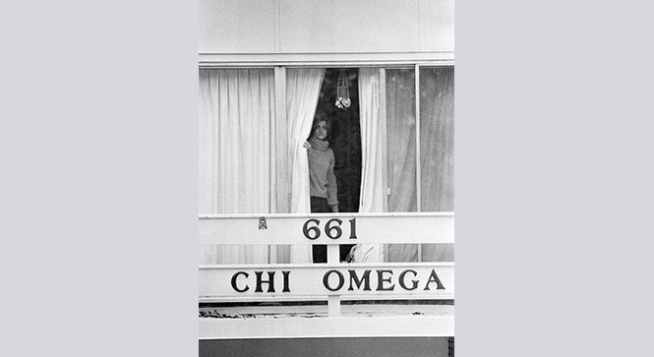 In the middle of the night on January 15, 1978 Ted Bundy went to the FSU Chi Omega sorority house. Once inside the house, he brutally assaulted five women, murdering two of the victims. Bundy was eventually put on trial for the Chi Omega attacks, as well as the murder of 12-year-old Kimberly Diane Leach.